Many people only think of Mendoza as Argentina’s wine capital; but truthfully, the viniculture is only one part of the province’s thriving tourism industry. Any trip to Mendoza should include some time to explore the mighty Andes Mountains that represent the province’s border. These options can all be done in long day trips from the capital, but you will probably want to stay longer to truly experience the natural wonders of the high alpine environment. Expresso Uspallata offers economic daily departures to all of these destinations, except Villavicencio. A more expensive, although much more comfortable, option does exist; all international buses bound for Santiago de Chile pass through these towns and will let you disembark wherever you choose. If you are lucky enough to have your own vehicle, its as simply as heading west on Route 7. Located 120km west of the capital, along the international route 7 that continues to Santiago de Chile, Uspallata is the perfect place to escape the city. Its excellent climate averages more than 300 days of sunshine per year. The city played an important role in Latin America’s history, as General San Martin used this area for several training operations before finally crossing the Andes and liberating Chile and Peru. Las Bovedas de Uspallata and El Campo Historico El Plumerillo are just two of the many historic landmarks you can visit near Uspallata. Situated in the high mountains that have been featured in many classic movies, including “Seven Years in Tibet,” the natural surroundings are simply stunning. With great sporting activities such as rafting, mountain biking and horseback riding, the options for adventure are limitless. For the truly adventurous, the Cardon Del Plata mountain range, a subsidiary to the Andes, is located near Uspallata and several guided treks will lead you above 6000m. This range is commonly used as a training ground before attempting to summit Aconcagua. Only 70kms west of the capital, Potrerillos is the locals’ favorite weekend destination. It can be visited on a long day trip but all the local activities make a multi-day visit more reasonable. 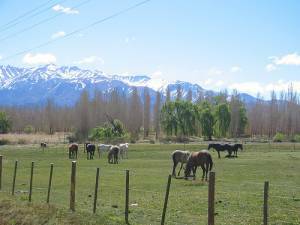 Situated in the foothills of the Andes, Potrerillos is home to the Mendoza River and Potrerillos Lake. Although all the typical mountain activities are available, mainly mountain biking, horseback riding and guided treks, Potrerillos is known for its water sports. Great fishing for several species of trout is available in both the river and lake, while the more adventurous will enjoy windsurfing or kayaking on the lake. Most rafting trips booked in Mendoza begin here, too. For the culturally interested traveler, be sure to check out the town’s small Centro Civico, Villa Las Vegas and the Potrerillos Dam to learn about the mountain lifestyle. The small town centers are built in traditional mountain style, while the modern dam facility provides power to much of the province. The town, which is named for the naturally formed bridge that spans the Vacas River, is rich in history. It has served as a luxury destination of the rich, a stopover for brave mailmen transcending the Andes on horseback and as a train station for the Transandine railway. In 1925, the Puente Del Inca hotel was built, offering an unusually high luxury accommodation for the local area. Each room was equipped with its own thermal hot spring bath. Although now deserted, since being destroyed by a major avalanche in 1965, the hotel and bridge remain a major tourist destination due to the unique colors, formations and landscapes that surround the area. The bridge itself is surrounded by myth. It is said that a group of brave Inca warriors joined hands to create a bridge over the torrential river so that their great leader could carry his paralyzed son to the healing waters of the thermal springs. Once the great leader was safely across, he turned back to thank his men but found that they had turned to stone, thus creating the Puente Del Inca. 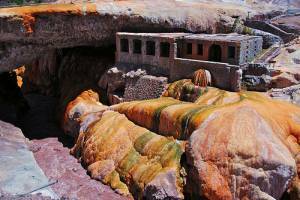 The thermal waters cured his son and are still believed by many to hold special healing powers. 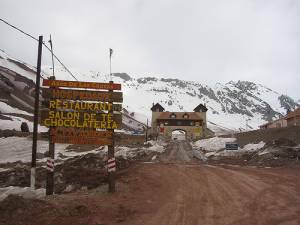 The small ski resort town of Penitentes sits 25kms east of Cerro Aconcagua, the continent’s highest peak. This location, known for its rugged mountain environment, is unfortunately located in a large rain shadow and the resort suffers from thin snow coverage as a result. In operation since 1979, the resort is known as a more economical option than the nearby world-class areas of Portillo (Chile) and Las Lenas (Argentina). Steep terrain and poor snow coverage can make for shorter seasons, but this resort is still very popular among tourists coming to experience snow for the first time. Week long visitors from Buenos Aires, Brazil and other foreign destinations always outnumber the locals on the slopes. The last stop in Argentina before arriving at the border of Chile, Las Cuevas is a quaint little town set in a very harsh mountain environment. Once a stop along the Transandine Railway, this town now serves as little more than a quick stop for international bound traffic. Las Cuevas, however, does have two wonderful attractions that are definitely worth exploring. The nearby Aconcagua National Park offers trekking, climbing and sightseeing for all fitness levels, while the car accessible Cristo Redentor statue sits at 4200m on the international border. This impressive monument also serves as an amazing lookout over the surrounding valleys and mountains. Located just off of Route 7, Cacheuta offer tourists some unique experiences. Cacheuta can be accessed by daily buses from the main terminal; Expresso Uspallata is the most reliable service, although other options do exist. This town is little more than a large thermal bath complex, but that alone is reason to visit. The Termas de Chacheuta is a massive resort that offers a number of indoor and outdoor thermal pools in a beautiful mountain setting. Water temperatures vary from ouch that’s hot to cold and refreshing but don’t worry, as they have many that can be described as just right! They also have a recently built wave pool and a lazy river, basically a circle shaped pool, which is excellent for cooling off and keeping younger travelers entertained. The resort also offers accommodation, spa services, including excellent massages, and a typical Argentine parrilla restaurant. Outside of the resort boundaries, the little town offers few services beyond a souvenirs shop, convenience store and small walking tours. For the adventurous, there is also horseback riding, rappelling, rafting and more activities, all organized through the resort. The beautiful natural reserve of Villavicencio is well known in Argentina because of the natural spring water sold throughout the country that portrays a panoramic photo of the area’s famous hotel and carries the same name. Surrounded by soaring peaks and dense forests, this beautiful area should not be missed.